This article is about the shiny bolt. For the rusty bolt, see Repair Juggernaut. The Superstrong Stabilizer (怪力金具フィックスマン?) is a treasure found in Pikmin 2. It is actually a shiny bolt found on the third sublevel of the Subterranean Complex, inside the Armored Cannon Beetle Larva stuck in the ground. It is a good idea to take out the fire geysers before collecting this item. 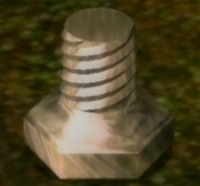 This treasure is very similar to the Extraordinary Bolt from the first game. Analysis of the Superstrong Stabilizer. A bolt from the real world. Spanish (NoE) Super-estabilizador Super-stabilizer In-game, it is always written with "Super" in one line, followed by a hyphen, and "estabilizador" in a different line. It is unclear if the name is hyphenated, or if the hyphen is there because a line break is needed. This page was last edited on December 12, 2018, at 18:31.